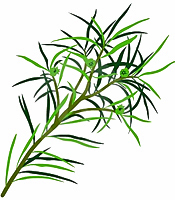 The essential Tea Tree oil has been scientifically studied according to its traditional uses as an antiseptic, used to treat all sorts of ailments in which infections were present, or suspected. These studies showed bactericidal, antiviral, fungicidal activities. The volatile character of the essential oil makes it an excellent detoxifier for the respiratory tract and the skin. The Tea Tree oil also comes with insecticidal and insect repelling powers, and is recommended in some places, to treat lice.